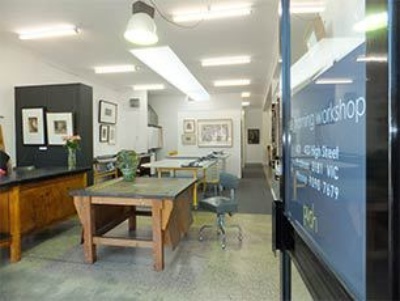 S&J Framing Workshop is the premise of Sal Courtney and Jo Hindhaugh - a pair with over 50 years’ combined experience in custom framing, teaching and art and design. We have come together to offer you professional picture framing in a friendly, creative space in our workshop in High Street, Prahran. We have created the Framing Workshop in order to provide a warm, relaxed and inspiring environment in which you can pursue or develop your vision. Whether you know exactly what you want, or have no idea at all, we can help you create beautiful finished works with your pieces of art. We are gaining a reputation for our contemporary and clever framing style and our use of natural timbers & hand staining. We also are known for our eclectic collection of framed works for sale adorning our workshop walls. A mix of vintage and local artists. A select and diverse collection. Whatever your needs, we provide exceptional customer service and professional, friendly support and advice.